Fear is powerful, especially when it evokes irrational decisions. This is ever more the case when it comes to the stock market. It is often said that the stock market is 90% emotion and 10% reason. This can be incredibly challenging to many retail investors as they see their investment portfolios go up and down like a yo-yo. What are we to do then, when increased volatility enters the market as it has lately? 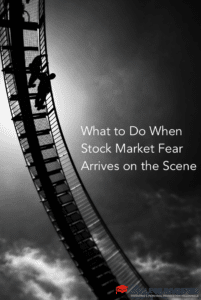 Editor’s Note: Keep in mind this article on stock market fear was written back in 2013. But that doesn’t mean there aren’t still lessons to learn. As this recent CNN Money article points out, the beginning of June saw seven out of eight days where the Dow Jones swung more than 100 points in a single day. While some investors may have the stomach to take such swings, it can lead many to make fear-driven decisions that can cost them in the long-term. Remember the article on whether book value matters when you invest? Fear can be a primary driver of your decision. I had the pleasure, or displeasure (depending on how you might look at it), of working in the online brokerage industry during the 2008 crash and saw how many ordinary, everyday investors were impacted by the wild swings of the market. As an aside, let me be clear that I am not saying that what we are seeing now is equivalent to what happened in 2008, but simply what fear can do to an investor. That said, many people were, understandably so, making decisions that they would not normally make and many have chosen to continue to stay out of the market leading up to today because of the same fear. The stock market would wildly swing by hundreds of points at a time, many times seemingly without reason, and it would leave investors shell shocked. They saw their portfolios sliced in half and years of hard work gone by the wayside. It is a given that when we invest in the stock market, we are assuming some sort of risk, which is largely dependent on the due diligence we do before purchasing a specific stock as well as the risk inherent in the market as a whole. A lot of this can go out the window though when increased fear and volatility enters the market which leaves many hesitant to actively invest. What we are seeing now, though, with posturing and whispers about what the Fed might do in relation to rates, is increased volatility which makes investing in the stock market somewhat akin to being on a roller coaster for many investors. I am not one that typically likes being on a roller coaster like this (in fact, in real life I can’t bear to ride on them), but that feeling is to some extent a sign of the times we are in which causes us to look at how we will act in light of that. If you have been a reader of The College Investor long, you’ll know that Robert views Warren Buffet as one of the top ten investors of all time and I could not agree more. I view this quote as pointing to two important points: the first is the need to avoid herd mentality when it comes to investing, and the second is to always be looking for opportunities while investing in the stock market. I think that anyone who knows just a little about Buffett will say that he has turned both into an art. All that said, I think a great way to try and turn fear in the market on its head is to be looking for opportunities, balanced with knowing what your own risk tolerance is and taking action if need be. Even in down days there can be opportunities available in order to grow your investment portfolio. Granted, many of these opportunities may require you to be a truly savvy investor that is educated to know where to find those opportunities in order to take advantage of them. Those who have separated their emotion from their investing have been able to ride the stock market back up over the last few years and lock in some pretty significant gains. The key is not holding yourself back because of that fear, but looking for ways to somewhat comfortably take advantage of what is going on in the market so you can grow your overall portfolio. Please do not take me as a cheerleader of the stock market. Rather, I am simply trying to have a balanced view of the market as a whole. Are there headwinds? No doubt there are. Could we see a pullback? That is also a possibility. Knowing these points I know it can be easier said than done to not let fear keep you back from investing in the stock market. As with many things in life, investing is something that largely needs to be taken with a long-term view in mind so the fear does not spook you into making a rash decision that you might not otherwise make under normal circumstances. As I mentioned previously, I saw firsthand how many investors allowed their fear to hold them back or to prompt them to make decisions they might later regret. This would involve selling on majorly down days, which would only lock in losses to then turn around and buy into the same stocks after they had significantly come back as opposed to riding out the storm. While it may make sense to get out of a stock after reaching a certain loss, to do so and then follow it up buying in at a high means that they’re getting hit on both ends of the exchange and ultimately making their emotion dictate their decisions as opposed to reason. If this is something you find yourself inclined to do, one way you could attempt to grow in that is find an investing mentor as DJ suggested recently. If you have not considered one before, they can be a great resource to help you wade through the volatility of the market and help improve your decision-making so that it is more reason-based. Like I said in the introduction, fear can be a powerful thing, just don’t allow it to hold you back. Find ways to make it work for you. Do you believe we’re seeing more fear and volatility in the stock market lately? What are you doing differently to take advantage, or are you staying the course? Seeing fear is one thing, predicting how exactly it will affect people is an entirely different animal. I know when I invest I can’t let it be driven by fear, but I think planning according to the fears of others is nearly impossible… fear by nature is an irrational act. I agree Michael. I do not let my investing to be led by fear, though that is easier said than done at times. At the end of the day though, the action needs to be because it’s right for you and not because of the fear of others. I wonder how the stock market and economic world has changed since Warren Buffett’s oft quoted remark about fear and greed. Not everyone can tolerate–financially or psychologically–the volatility in stock prices. I think we have to take an honest look at ourselves and judge whether we’re able to stick with it for the long term, no matter what. If not, I don’t think we should be investing in stocks to a great extent. There are alternatives, equally or better capable of generating a retirement nest egg, though they’re of course denigrated by the Wall Street marketing machine. That’s a good point Kurt, though I would venture to say that since he is known the way he is that he would continue with the same remark. I agree that not everyone can stomach the tumult in the market. Funny, I wrote this just over a week ago before it hit the fan the past few days. 😉 You have to know what you’re comfortable with and what fits your needs. I’m opting to do nothing right now. I’m not even going to look at the numbers for the next month — I don’t have enough in there for an irrecoverable loss, and I don’t have any more cash to spend to buy more stocks until next payday! I ditched my most volatile stock 2 days ago, and now I feel confident in the rest of my portfolio to not feel motivated to abandon ship even if stocks go down. I don’t plan to let fear determine when and how I invest. I had some great returns from investing in 2008 when everyone was selling off their stocks. I just wish I would have had more money to invest.